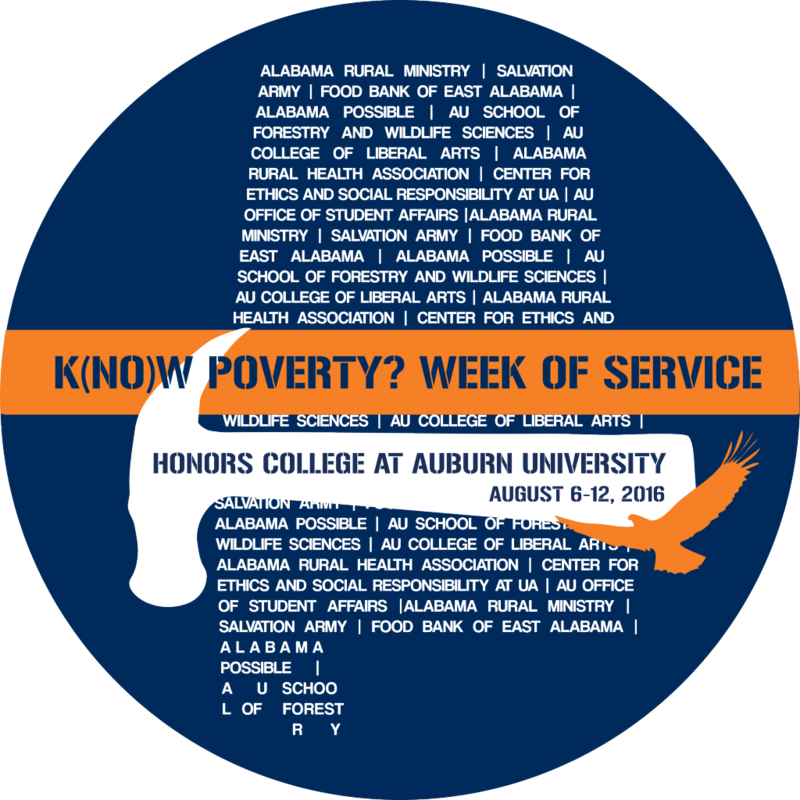 In 2013, the Honors College adopted a theme of poverty as a means to raise awareness on the current issues surrounding poverty across the state of Alabama to our students. 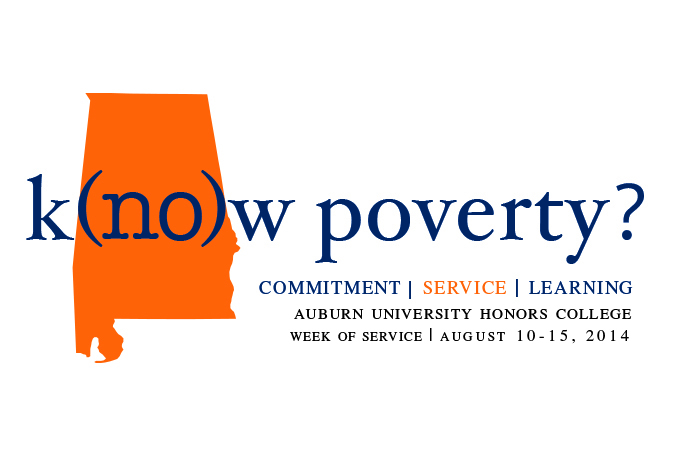 In keeping with Auburn's land-grant mission and with Auburn's historic commitment to service, the Honors College developed the k(no)w poverty? Week of Service program. This program was created as a way to give students first-hand experience to the wide array of poverty. Developed as a service and service learning series to incoming freshmen, the program both is both challenging and enlightening. 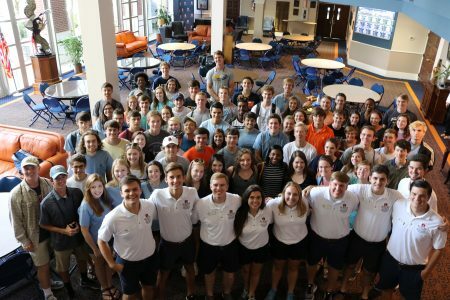 Participating students have stated the week is an "eye-opening experience" and the "perfect way to start their career at Auburn University." After the k(no)w poverty? Week of Service, students should be able to articulate the root causes of poverty, and the propagation of the cycle of poverty. 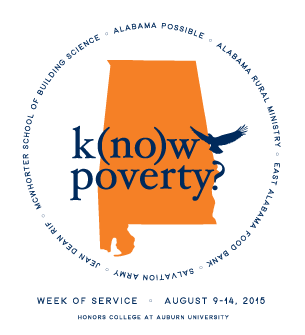 Participants will experience how intentional service can help alleviate poverty and learn about opportunities to serve the community through the Honors College and Auburn University. Students living on campus will move in on Friday, August 11, 2017. An Early Housing Move-In Fee of $90 will be charged to the student. If this fee is unaffordable, and the student shows documented financial need, please contact Dr. Ken Thomas via email. Students living off campus should move in on Friday, August 11, 2017, as well. Students living off campus will need to arrange permission with their residencies (apartment owners, landlord’s, etc.) to move in on this date. Some places have different move-in dates. 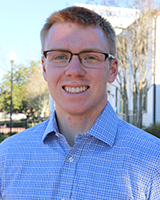 If university documentation is required for an early move in, contact Dr. Thomas via email and he will assist you. Service Training will begin on Saturday, August 12, 2017 at 9 a.m. so students must be settled into their accommodations by then. Do I need a car to participate? No, participants are free to drive, but transportation will be provided for those without vehicles. Do I need to live on campus to participate? No, any incoming Honors College Freshman is eligible to apply. Will I get to move into my actual on-campus room if I participate in the WoS? Yes you will. Housing will send out specific instructions on when and where to get your room key. Housing move-in registration is open, what should I do? Register or not? Yes, register for move-in as if you are not attending the program. 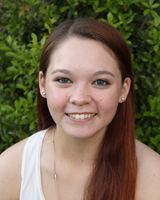 If selected, the Honors College will notify you, and place you on a modified move-in schedule. Are meals provided during the WoS? Most meals are provided during the WoS. A schedule is provided that clearly indicates when and where meals and snacks will be provided. Participants with special dietary restrictions will be accommodated as much as possible. Can I participate with dietary restrictions? Yes, we will work with you to ensure your needs are met. Will campus dining be open during the WoS? Limited campus dining locations will be open during the WoS till Thursday 17, August when regular dining operations will commence. Where can we park during the WoS? Students that live both on and off campus will be allowed to park on campus during the WoS based on an arrangement with Parking Services. Participants that are accepted into the program will be notified of designated areas for parking in advance of arriving on campus. Will I have the opportunity to do other activities during the WoS? The WoS runs all day with mandatory and optional activities at night. 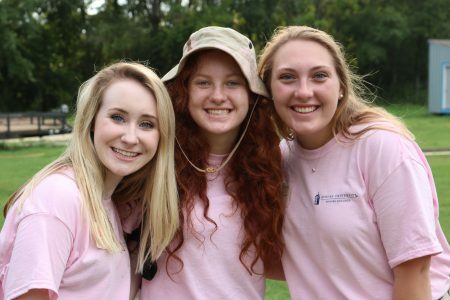 In order to be fully immersed in serving and getting to know fellow freshmen, it is recommended that participants not be involved in any other activities that week. What is the k(no)w poverty? WoS class? This class is a 1 credit hour pass/fail Honors College participation course (i.e. does not affect your GPA) that would run in the Fall semester. The class only meets 6 times over the semester. See “Course Offering: HONR 1087. How can I sign up for the k(no)w poverty? WoS class? At the time of signing up to participate in the WoS, you will indicate whether you want to be in the class or not. Honors College staff will then place students in the class. This class will remain closed throughout CWE since only participants are eligible to be in this class. Students will have the opportunity to take a one-hour Honor’s participation course. This class will allow students to discuss in a greater depth poverty and possible solutions to poverty beyond community service. The class will meet about four to six times over the course of the semester. Students cannot register for this class at Camp War Eagle. Students must request to be placed in this class after participating in the week of service. 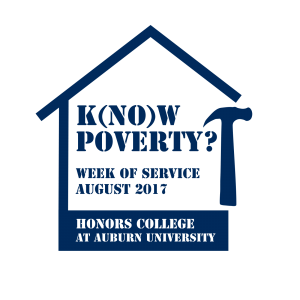 Week of Service participants have the opportunity to gain up to five credits towards completion of the Honors curriculum. Students wishing to gain credit will have to register for the associated courses in Fall 2018. Students cannot register for this class at Camp War Eagle. Students must request to be placed in this class after participating in the Week of Service. Requests can be made to Dr. Ken Thomas. In this Honors participation course (1 credit hour) students will explore the risks of poor construction and unsafe site practices. The class will meet about four to six times over the course of the semester. 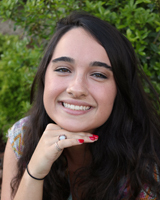 Students will have the opportunity to take this (1 credit hour) Honors participation course. This class will allow students to discuss in a greater depth poverty and possible solutions to poverty beyond community service. The class will meet about four to six times over the course of the semester. This year's k(no)w poverty? Week of Service incorporates two common read books. In this participation course we will continue dissecting both books over the semester. This course will give students the opportunity to work on real issues that service providers face in attempting to alleviate poverty. The service providers that students will work with are the ones that we would have worked with during the Week of Service (egs. Salvation Army, Alabama Rural Ministry, Jean Dean Reading is Fundamental). It is envisioned that students will work in teams on a special project that answers a real world or research problem for a service provider. This seminar is a (3 credit hours) academic course and will meet eight to twelve times over the course of the semester. An additional (1 credit hour) Honors participation course is offered in Spring 2019 for Week of Service participants which will allow students to obtain six (6) credits total from their Week of Service participation. "This week was so worthwhile. I wasn't sure what to expect except that [we] would be doing "work, hard work." I learned so much from this week not only about poverty (although my eyes were certainly opened) but about making connections with people. 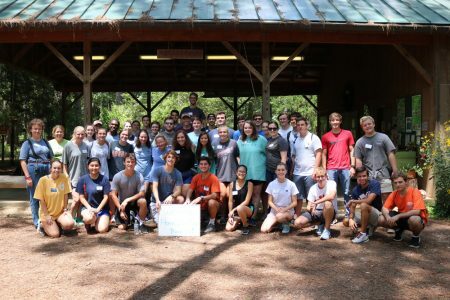 I made connections with people who ran the worksite, with my counselors, with fellow participants, and I'm very grateful for that. I didn't expect to have as much fun as I had, and if I had been on the fence before I came, I'm definitely not now." "It felt like I was making a difference in this community." 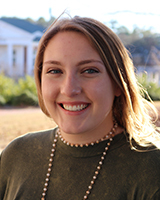 "I came to Auburn from out of state with no friends, and the small size of the group of week of service participants allowed me to work closely with others to make new friends." "It was amazing to see the effects of poverty, and how people in different situations are doing small things to help others." 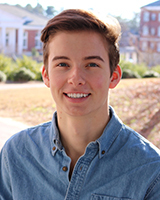 "Week of Service allowed me to gain a close group of friends with similar interests before I had to dive right into classes. I think it was incredibly beneficial and fun." "It allowed for learning as well as making meaningful connections with others." Week of Service "Top Five Reasons Why"
Our current counselors shared their perspective on the k(no)w poverty? Week of Service and a few things they learned along the way. 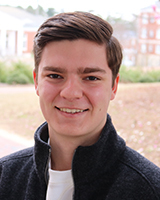 "I fully expect this Week of Service to be super beneficial for everyone involved, from learning about the prevalence of local poverty and its solution to making lifelong friends. See y’all soon and War Eagle!" 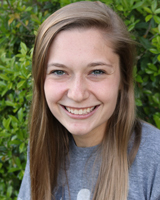 Hometown: Birmingham, Alabama Major: Microbiology Minor: Hunger Studies Interests/Hobbies: Playing with dogs, Running, Reading, and Traveling. Registration for the 2017 Week of Service is now closed. - Participants will earn class credit for Honors Participation through (HONR 1087) Honors Hands-on Service & Service Learning. - No fee to participate. Includes t-shirt, lunches, welcome dinner, two breakfasts, transportation, and supplies. Anyone who is not able to afford this fee and has documented need can contact Ken Thomas via email. - Optional activities included to meet students before and during program. "I loved it . 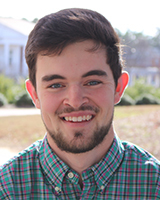 It honestly opened my eyes to the poverty I am surrounded by living in Alabama." "It was super amazing and really enlightening!" 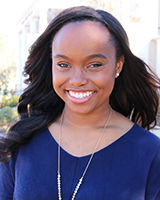 "It opened my eyes up so much and all the people involved were so real and welcoming. I was really not excited about it starting the week, but after the first day I was so excited. 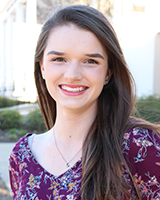 It has inspired me to want to work with several service based organizations on campus, and it showed me the importance of volunteers in the community." 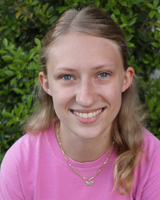 "I really enjoyed the Week of Service. It far exceeded my expectations. 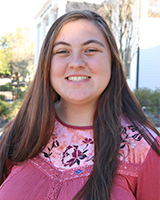 I am so glad that I participated in the Week of Service." 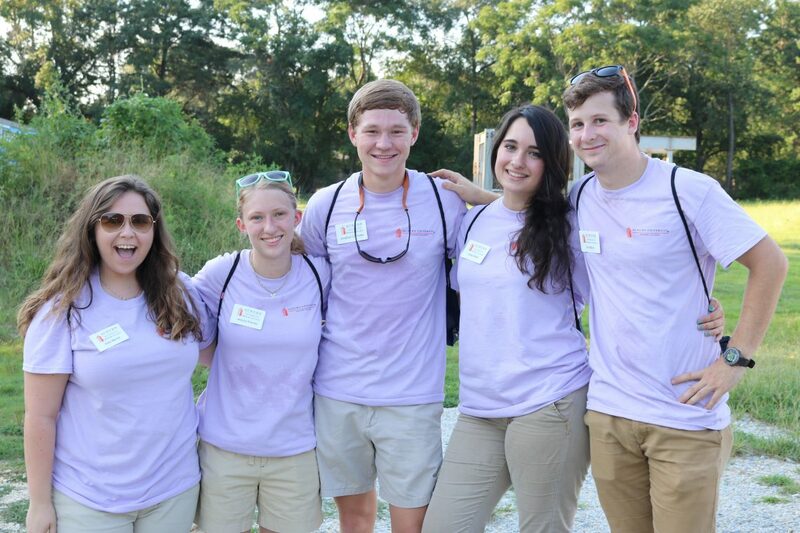 "The Week of Service was an extremely rewarding experience." "The Week of Service was absolutely amazing. I made friends, gained knowledge about poverty, and had tons of fun. Also, the counselors were wonderful. Thank you!" 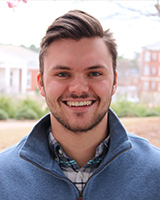 "This is a great opportunity to get to know new people in the honors college, learn about the nature of poverty in the United States and what you personally can do about it, and serve others in the local Auburn community." 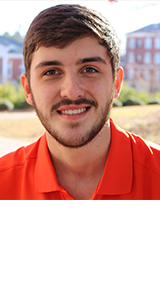 "I expect this week of service to be enlightening for the students about themselves and their community." 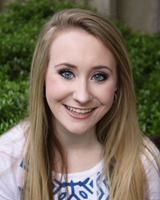 "I’m so excited to be part of so many freshmen’s first college experience!" Interests/Hobbies: I really love reading. I have a dog named Charlie, and we love to take walks around the pond. 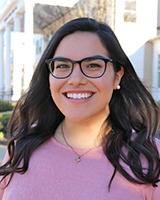 "I hope that this year’s K(no)w Poverty Week of Service is an opportunity for students to get connected with the Honors Community and to experience various ways to serve in the area that we will call home during our college years." 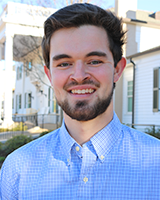 "I fully expect this Week of Service to be extremely beneficial for each person involved, from learning about the prevalence of local poverty and its solution to making lifelong friends. See y’all soon and War Eagle!" Interests/Hobbies: Playing with dogs, running, reading, and traveling in my spare time. 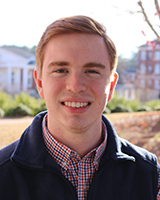 "So excited for the opportunity to work with the other counsellors and our 50 incredible freshmen as we serve Auburn's beautiful community!" 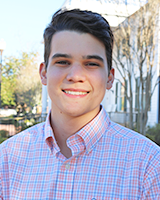 "I think the upcoming Week of Service will be a great way for the incoming class to really get involved with their new community and will make their transition into college so much easier by meeting new people and making connections into other organizations!" 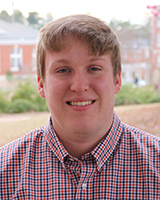 "Friendships I made, with fellow Week of Service participants, and hope to facilitate this year, which ultimately have helped usher me into the Auburn family, have supported my intellectual, social, and academic life at Auburn. I hope to facilitate a positive intellectual environment that allows for friendships to be made with like-minded students this year that can continue their k(no)w poverty? experience into the academic year and beyond." 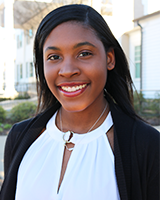 "I am very excited to find out where this year's events will take place and how many people it will impact. 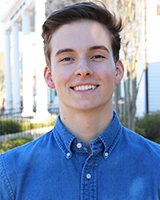 Have done so much research on poverty since the 2015 Week of Service, and I would really love to have more opportunities to make a difference." 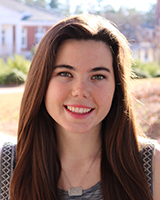 "I hope that the 2016 WoS changes lives just like it changed mine." The first optional activity starts at 5 pm on August 5th. Please do not feel rushed, there will be plenty of time to move-in and get settled into your room. Download the 2014 packet of information given to all k(no)w poverty? Week of Service participants.